You'll probably never see this in any consumer devices. But it will probably make its way into military hardware one day - the US Army and Navy LOVES both high voltages and high frequency AC power. Neither plays nice with modern semi-conductors. I think it's a kind of confused high voltage area of electric preprogramed logic thru microswitches on silicon substrate, not micro vacuum tubes and such.More like tunnel diode logic.Just my two cents. You seems to have opinion without much knowledge. I can see it being used for fiber, car, power circuit etc. Analog fidelity in a digital world? As the article mentions, that might be useful in power electronics. As for TTL (5Vdc) semiconductor electronics, a replacement for the silicon transistor is sought after, e.g. Bismuth or Graphene Transistor, etc. Intel is currently pursuing what's called compound III-V semiconductors, where "indium arsenide" (for transistor n-channels) and "indium gallium antimonide" (for transistor p-channels) are to be grown as the top active layer over a silicon substrate instead of silicon over silicon, since silicon's electrical capabilities have been tapped for the most part. That III-V semiconductor single crystal layer has superior electrical properties and power efficiency over silicon at smaller transistor sizes. The defense industry still uses vacuum tubes to handle switching and amplification - not because they are better, but because silicon simply can't handle the job. There are some semiconductors that can - like Gallium Nitride (GaN) - but they are still very new, expensive, and not "battle tested". You might see it in the power grid, but that is still not a consumer product. Even then, the solutions we have there can handle the 50/60Hz and 110/120V just fine, and this solution doesn't seem to offer any marked efficiency improvements, just increased operational ranges - so I doubt a switch to this tech, unless it turns out to be much cheaper or much more reliable. Cars for the most part don't deal with anything above 12V and a few Amps - not high power - which silicon can be made to handle. EVs and Hybrids do deal with higher voltages, but still, we have solid state and electromechanical tech that can handle their requirements. Audiophile usage was one I hadn't considered, but it would need to show some kind of improvement over current tube-amps to catch on. The only reason we 'old' tech for high end audio is because it is still a smooth continuous signal, while semi-conductors are either noisy or use discrete signals - and tubes are very good at what they do. 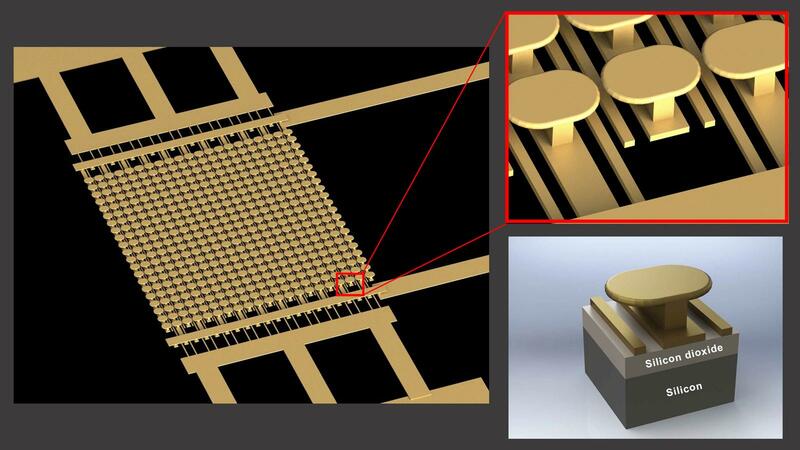 The downside for these lower power tubes is the expense involved because of low-volume production, so this new metamaterial semi-conductor isn't likely to catch on unless it is much cheaper than old-style vacuum tubes (doubtful, seeing as it is more complicated in design and principle: lasers, complicated nano-scale structures). Fiber optics has zero usage for this: that is photons, not electrons. Pure signal, no power transmission. And power circuits was what I first suggested, but the only ones operating at high frequencies and high powers, matching the usage description in the original paper itself, are military in nature. Military hardware was designed that way because they were first designed with vacuum tubes, but also for various system compatibilities: like S-band and X-band antennas, and other 'radio' tech. Now, to maintain compatibility, they still use those high powers and frequencies, even as they transition to solid state tech. It sounds like there is a waveguide like pattern that has been impressed on the device, and this pattern is key to the device operating with a low power IR laser stimulating electron emission via the photoelectric effect. My guess is that it is because of the dimensions of the waveguide that allow this device to operate as it does. In other words, the pattern on the waveguide is probably some multiple or fraction of the wavelength of the IR laser, and that is what really allows this device to work at 10V which, as I see it, is not a particularly high voltage. However, if the device has characteristics such as those that allow Power MOSFETS to be easily combined in series and parallel, then the applications may be wider than the scientists expect at this moment. I would not be surprised to see further improvements in this technology by tuning both the waveguide and the material on which the waveguide is impressed. I.e., find a material with a lower ionization energy, or that is more easily excited with different wavelengths of laser light, or a combination of both by optimizing the waveguide pattern. Yeah, if this pans out to a viable product, it is going to huge for radar receivers/exciters, and anything else along those same lines. Let's hope so. I've been a tube amp fan for years. Making tubes is a very dirty process. They will still need to learn to recreate the differences such as a 6L6 vs EL84.